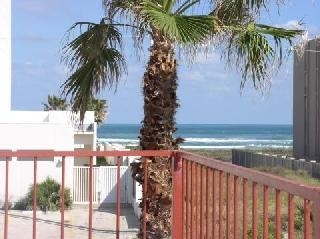 South Padre Island, TX—Colorful, 2 story, 4 Bedroom, 3 Bath, Mediterranean Style Villa with private pool; just cross the street to the beach! Weekly and nightly rates available on request. Rental prices may vary depending upon length of stay. 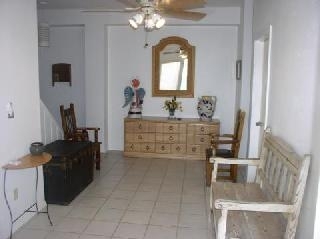 2 bedrooms, 2 baths on lower level, living room + dining + 2 bedrooms, 1 bath on the upper level. 2 large verandas with ocean views. 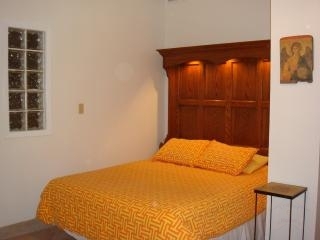 Private pool, cable television, washer & dryer in the Villa; maid service available upon request. 2 car garage + boat parking. 30 minute drive to Mexico for shopping. Walk to local shops and restaurants, or use complimentary trolley out the front door that passes every hour. Local shopping and fine dining close by. Family-friendly town with go-carts, miniature golf, theatres, night life for all ages, fishing bayside or gulf, jet ski and boat rental. Friday evening fireworks (summer only) can be viewed from the Villa's pool or veranda. Excursions to Mexico available. Payment Methods Accepted: Personal Check or Cash. Deposits: 50% to hold your dates; balance due 30 days prior to arrival, $200 key deposit - refundable, $500 Security Deposit refunded 30-45 days after departure providing the property is left as it was upon arrival. Cancellation & Return Policy: Your deposit is non-refundable. Fees & Taxes: $150. cleaning fee due with final payment.